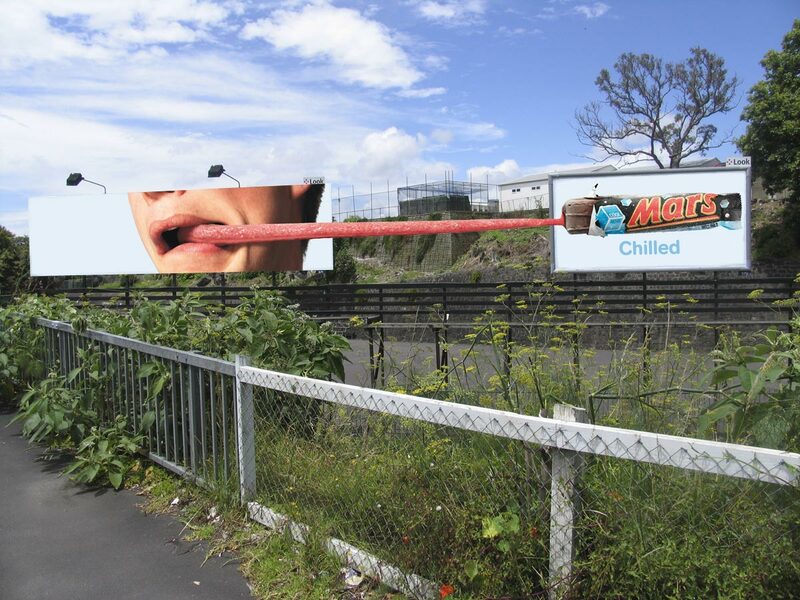 Masterfoods NZ is promoting “Mars Chilled” in New Zealand this summer with an eye-catching print and outdoor campaign. Mars Chilled has a thermo chromic wrapper with graphics that change when it is chilled below 4 degrees. You’ll find it in the drinks fridge at your local service stations & dairies (the NZ name for milk bars/corner stores). There are six different designs released for a limited time. Masterfoods worked with Colenso BBDO to encourage the consumption of chocolate during the summer months. The creative team came up with the concept of a product so cold it would affect the body’s extremities – thus a male bather so affected by cold he changes gender, and a tongue frozen stuck to a chilled Mars bar. The Mars Chilled ‘Dickless’ ad has been produced as a poster and put up in beach shacks around NZ. The product is also being promoted through giveaways at various beaches throughout summer. The ‘Tongue’ billboard can be seen on two billboards, eight meters apart, on Khyber Pass Rd in Auckland. See responses from advertising professionals at Ads of the World for Dickless and Chilled Tongue. The Mars Chilled summer campaign was developed at Colenso BBDO, Auckland, by creative director Richard Maddocks, art directors/copywriters Jonathan McMahon and Lisa Fedyszyn, account director Katrina Ingham, account manager Lucy Pilkington and agency producer Jo McMillan. ‘Dickless’ was photographed by Matt Baker, Ponsonby, Auckland, with retouchers Berrin Moody, Carl Baker and Michael Currie. ‘Tongue’ was photographed by Stephen Roke with retouchers Tristan Dunk and Michael Currie.